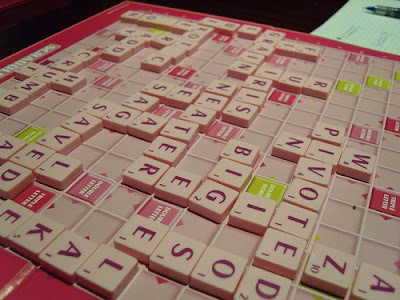 I had an awesome last night with friends playing Pink Scrabble and eating yummy Pink Cream Cake. We ended up playing Take 2 with the Scrabble pieces (which is such a fun and addictive game) after our game of Scrabble. Guess who won both games?? The Pink Cream Cake is apparently a Jelly Mould Tupperware recipe that I heard about and sampled last week. Very tasty and very easy to make. I am sure you could use any sort of mould if you don't have an actual Tupperware mould. Crumble the flake bar around the bottom of the jelly mould. Spoon a layer of whipped cream on top. Break sponge cake into smaller pieces and place them on top of the whipped cream. Spoon the drained berries onto the sponge (saving the drained juice for later). Top up rest of mould with remaining whipped cream, and pour drained juice on top. Place lid on top of mould and set in fridge overnight. Once it is set, remove lid and turn upside down onto serving plate. Very tasty and easy to cut. I love all the pink inspiration! Looks tasty. If you like puzzles, love TV and anagrams, here's one for you: vain sync. R E M A T C H!!!!!! Yum, Yum! I must actually use the tupperware jelly mould I bought on impulse (at a party) about 3 years ago! I swore that I'd use it all the time... lol! 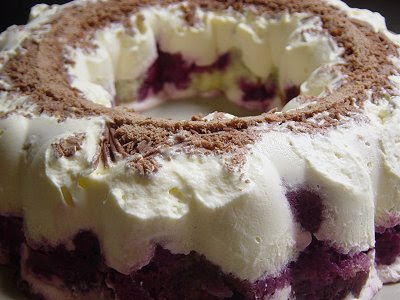 That yummy looking cake deserves a real whipped cream recipe. Like the pairing of game with dessert. I'll have to think on that. Thanks. Yeah! That cake was SO good! I agree with Nina...rematch!